For the very first time in its 9 year history, your FASF has found a real world home office. For more than six of those years the Foundation has been trying to locate a headquarters (“HQ”) office that it could call home right here in Columbus, NM. At the beginning of the new year, we will be moving from various separate locations and consolidating our operational HQ into our new and very first home office. We came close back in 2014, but the planned arrangement didn’t work out. Then, in early 2015, one of our local business members, Roberto Gutierrez, who owns and operates the only grocery in town, offered to let us use as much of his old vacant San Jose Grocery facility as we’d like. Mr. Gutierrez built a brand new facility right on the main East West highway (Route 9), just East of downtown, where the new San Jose Grocery and Lounge are now located. Upon close inspection, however, we discovered that the old store facility would take too much expensive modification in order to be suitable for our administrative office. It was much too large for our current needs, and would have required we erect costly new partition walls, refurbish the rest room and make other expensive repairs. At this time we’d like to publicly acknowledge and graciously publicly thank Mr. Gutierrez for his generous offer, which we were unfortunately unable to accept. But our disappointment soon quickly changed, when another one of the Foundation’s local Business Supporters made us an offer of an office in her facility, which also houses the re-instituted old Columbus Chamber of Commerce. Norma Gomez, who has single-handedly brought more grant and other construction monies into this small town than any other citizen, and who re-opened the defunct old Columbus Chamber of Commerce this past year, has generously gifted the Foundation with its very own office, right in her Chamber building. 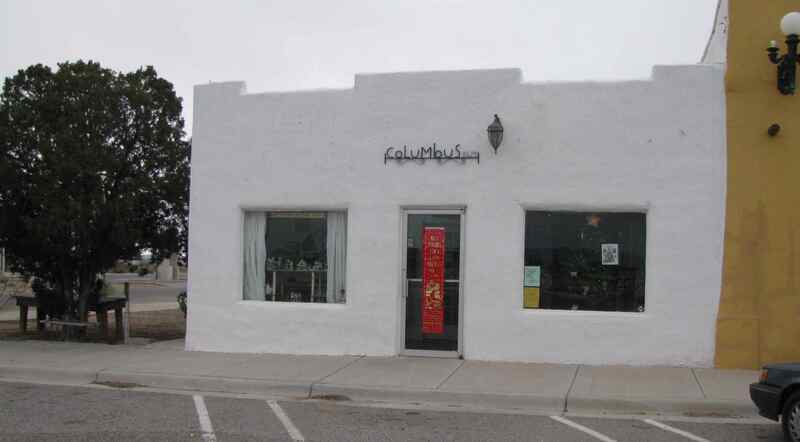 The location is literally in the center of Columbus and directly across from both the Library, Post Office and very close to our bank, the First New Mexico Bank, which, along with the Library, is also a local business supporter. So, thanks to Norma, for the first time in our existence, your Foundation now has an official Headquarters right in downtown Columbus! As mentioned, until this time we have had to operate out of our Board members’ homes, with records scattered all over town and even up to Deming, NM, 30 miles to the North. A very inefficient and unwieldly arrangement. We hope this new start in Columbus will prove a good omen for the coming year of 2016 – the year of our big Centennial Celebration. Pictured below is a photo of the new HQ Office, which is behind the window on the right side of the building. New HQ Office of FASF in Columbus – Our bank is in left background behind tree – building next door to the right is FASF Aerodrome Editor July McClure’s renown Tumbleweed Theater. FASF Office is behind window at right. This entry was posted in HOT NEWS! on December 27, 2015 by FASFRIC. Good show ric. Congratulations to FASF. Jerry Also thanks for the nice card after Patty’s passing. Thanks, Jerry. We’re pretty excited to have our very first real office – and to have it right downtown, too. We’re really lucky to have such great local support, which helped make it all happen. Our new landlord is not just a proud FASF member, but a phenomenal local activist who’s done things for this town that are basically unparalleled – an extraordinary young lady. We are truly blessed. I was in this building hundreds of times from 1953 to 1958, this being the local post office at the time. Mrs Matthews, a widow, was the post mistress and lived in the back of the building.We lived in the Railroad Section Formans house next to the Depot, so it wasn’t to far to get the mail. The Theater building next door was the drug store where we socialized and drank Cherry Cokes when we could come up with the money.